Men's Fashion Week is now in full swing, and over the past few days, the Milan schedule has brought the industry's best dressed away from their holiday plans and onto the streets in the June sunshine. Sure, there are more men involved in this side of the fashion business, but there's still enough of a trendsetting female contingent to provide plenty of summer outfit inspiration. Bloggers, editors and models alike have pounded the pavement in a smorgasbord of stylish ensembles—from ’90s supermodel-inspired dresses to retro prints to showstopping lilac dresses and wedding-worthy pieces. 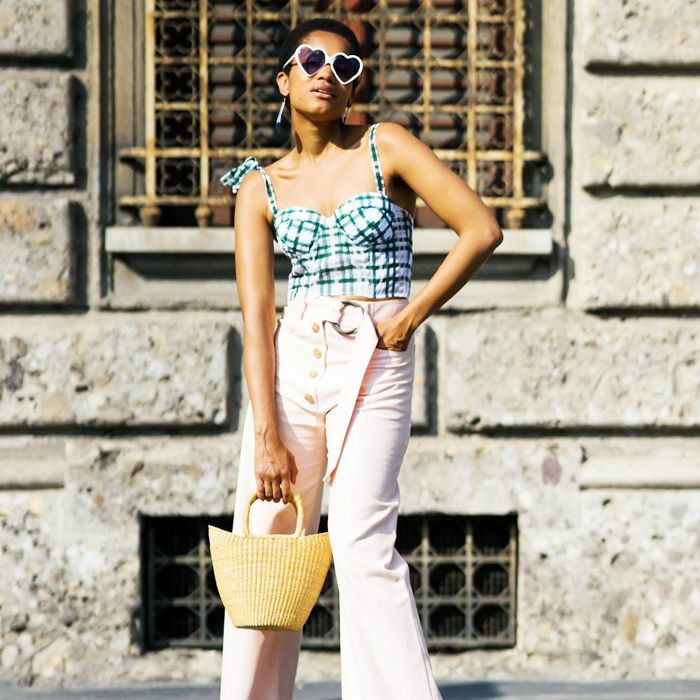 The photos ahead are a treasure trove of hot-weather style inspiration. So sit back, relax and enjoy our edit of the best street style moments from the world's coolest women. Style Notes: This street styler demonstrates the traffic-stopping potential of a power suit. Style Notes: This curve-clinging number harks back to the '90s with its asymmetric cut and gold details. It's the embodiment of Italian glamour. Style Notes: Model Theresa Hayes will surely silence the chunky trainer haters with this laid-back ensemble. The knotted denim shirt feels very Carrie Bradshaw—especially when paired with a tartan mini bag. Style Notes: We love this abstract vintage-looking print on Sartorialist fashion director Jenny Walton. Style Notes: The phrase "less is more" is embodied in this sculptural shirtdress. Note the knotted silk scarf that adds visual interest to an otherwise minimalistic look. Style Notes: There aren't many who could pull off this lilac showstopper. With berry lips and mirrored sunnies, this street styler makes it work. Style Notes: Now this is a look we can get on board with. Influencer Linda Tol shows that wardrobe staples can rival even the most flamboyant of street style outfits. Style Notes: Yep, you can't go wrong with a slip dress over a white tee. Style Notes: Here's how to accessorise the right way. A white blouse and jeans always look better with an It bag and statement sunnies. Style Notes: Model Chiara Scelsi is a girl after our own hearts with this summery Dolce & Gabbana frock. Take note for summer weddings. Style Notes: A casual printed tee is a match made in heaven for this dramatic, floor-skimming skirt. Style Notes: Who knew equestrian style could be so covetable? Influencer Caro Daur adds a contemporary twist with knee-high Western boots and a Fendi-stamped shirt. Style Notes: Yet another lesson in S/S 18 accessorising. A bow-tie straw hat and bucket bag are all you need this season. Style Notes: Head-to-toe beige is one of our favourite styling tricks for this season. Style Notes: A red trench instantly elevates this miniskirt-and-trainers combo. Style Notes: High-waisted jeans are here to stay. Smarten them up with a pair of pointed slingbacks. Style Notes: Bohemia gets the urban treatment with the addition of sharp sunnies and paisley-print bandana. Style Notes: This is "just woke up like this" dressing at its very best. Style Notes: Seashell accessories kick this sundress into 2018. Style Notes: Need something to liven up a colour-blocking outfit? Add a sunshine-yellow sunglasses chain, of course. Next, see the nine new-in pieces we're aiming to buy this week.